You have to hand it to Bang and Olufsen. Despite being 90 years old, the Hi-Fi brand has really adapted to the digital age in 2017, first with a modular set of wall speakers called the BeoShape Sound and now with a pair of true wireless earbuds. The headphones, new for IFA 2017, are called the Beoplay E8 and they’re looking to steal some of the spotlight that the Apple AirPods have enjoyed. 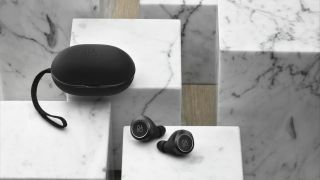 Despite the obvious similarities between the two earbuds, Bang & Olufsen is doing what it can to keep the company’s signature sound quality consistent in the new form factor. The greatest tools it has in that fight are a new Transparency Mode, a feature that uses an external microphone to pipe in sound from the outside world, and the ToneTouch section of the B&O app on iOS and Android that allows you to adjust the tonality and sound staging of the headphones yourself. These two features, in addition to its 5.7mm dynamic speaker, a small electromagnetic transducer, NFMI technology and a Bluetooth 4.2 chip with Digital Sound Processing should help the new headphones sound just the slightest bit better than its competition. So, when can you get a pair of your own? The Beoplay E8 will be available October 12 in Black and Charcoal Sand for €299 / $299 / £259 / AU$449.